Metadata is the single most important tool publishers can use to market and license products and generate sales in an increasingly crowded marketplace. Read our report on the conference. 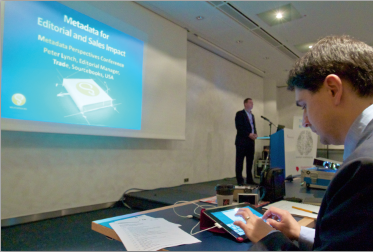 This year, Publishing Perspectives’ editor-in-chief Edward Nawotka organized the first Metadata Perspectives Conference, which took place at the Frankfurt Book Fair. Speakers from large and small companies around the world spoke about the importance of good metadata and its impact on book sales and discovery. Read the rest of the Metadata Perspectives report. 12:40-13:05 Metadata Reloaded: Selling Books in the Digital Age Ronald Schild, Libreka! *Please note that the conference program is subject to change. In this session we will tackle several topics, including defining what metadata means in today’s publishing environment, showing the different types and forms of metadata, and demonstrating why metadata is such critical issue when creating intelligent content and developing content strategies. We all know that metadata is an important part of marketing, sales and SEO, but we treat it like it’s one “thing”. But what is that “thing”? How does it come to be? Why is it right on the cover of the book, but wrong on the online retail site? In his talk, Toolan will explain how some publishers have learned to get this process right, and it is easier than you think. In the rapidly changing global book market, actionable product metadata is an essential, not a luxury. The ability of data aggregators to collect, harmonize and normalize comprehensive product data to provide useful and consistent metadata, meeting industry standards and customers’ needs, is therefore a huge benefit to the book supply chain. Whilst the supply of physical products is significantly improved by reliable product metadata, the supply chain for digital products cannot function without it. Most publishers understand how to create metadata with a print product in mind. But what about digital? Now that publishers can distribute their content more broadly via diverse digital platforms, from retail to social media, what changes are required? As a publisher, how do I manage my metadata for production? Where does it have the most impact? What does my sales and marketing team need? Libraries not only purchase your product. They also aid in creating interest for it, which can lead to more individual’s purchasing your product. What metadata is useful to librarians? What format do they need it in? This session will explore these answers and talk about the role metadata suppliers, such as Bowker, in this process. It will also show some interesting software available for librarians and library patrons. Using the European Union’s CELLAR project as his basis, Mr. Schmitz will discuss how the Publications Office implemented new metadata protocols to allow citizens to use, publish and distribute information — legal and otherwise — developed by the EU. He’ll offer concrete examples of what worked, what didn’t and what is being developed for the future. Discovery on search engines is paramount to publishers. Michael Bhaskar, digital publishing director of Profile Books in the UK, will talk about the recent, profound changes Google has made to its discovery algorithms, from the advent of PageRank to the new Panda/Farmer process. He’ll discuss how to craft proper book descriptions, how this impacts discovery, and the three most common errors you can make. In this session, we will explore best practices for how editorial and other departments can utilize metadata to drive positive impact on sales and expand the readership of the author. We will explore specific practices, along with examples and case studies, to illustrate the benefits of engaging all departments in the metadata creation and upkeep. Case Study: The German Books in Print database (VLB) as the central hub for marketing and sales support.